Far more than an ordinary push block, the GR200 is a highly evolved workpiece support system that enables you to safely rip strips as thin as 1/4″, resaw, rip small or angled pieces, short offcuts and more. It applies even pressure to both the main stock and the offcut piece, preventing snipe, lifting, burning and kickback. The high-friction pads cling firmly to any point along the stock, enabling the GR200 to easily grip oddly-shaped pieces – great for pattern routing. 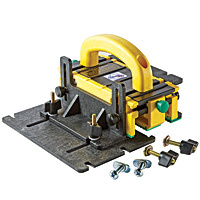 Unit comes with 1/4″ and 1/2″ side legs, adustable center leg, adjustable 1″ fence-side spacer for wider stock, and a stabilizing accessory plate with balance unit for leveling the unit when cutting narrow pieces and for attaching shop-made fixtures. Also includes comprehensive users manual. Made in USA. This entry was posted in New Products, Power Tools and tagged GRR-Ripper GR200 System by bdks. Bookmark the permalink.